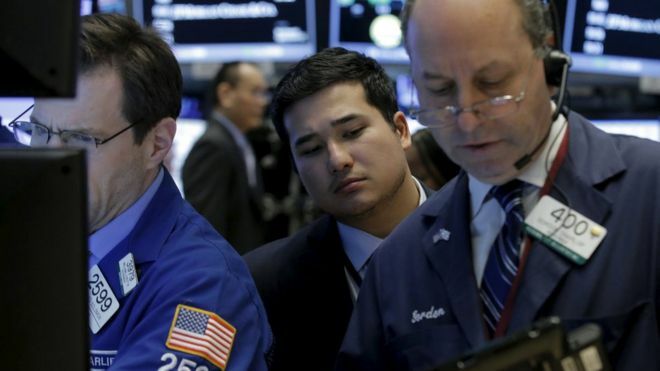 The Dow Jones Industrial Average slipped 24.72 points to 6,388.71, while the S&P 500 was down 0.24 to 1,917.59. The Nasdaq composite rose 16.89 points to 4,504.43. Inflation data showed the core consumer price index went up by a bigger-than-expected 0.3% gain last month, a figure that prompted fears that another interest rate rise might be justified. Energy stocks trended downward as oil prices continued to fall. Apache Petroleum and Continental Resources each fell 4.5%. West Texas crude lost 2.7% to $32.04 per barrel and Brent Crude was down 3.1% at $33.22 a barrel. Tech stocks had a strong day. Amazon shares rose 1.9% and Facebook 1.1%. Travel booking website Priceline rose 2.5%. “Investors are concluding that a lot of the technology stocks are insulated from the vagaries of oil,” said Jack Ablin, chief investment officer BMO Private Bank.